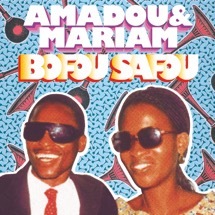 “Bofou Safou” feels like an instant classic, an earworm that will lodge itself in the listener’s brain and wipe away any frustration caused by the five-year hiatus in Amadou & Mariam’s release of new material. There is no sense of complacency here, nor are there any gimmicks. Just Afrobeat-disco in its boldest form. Backed by the outstanding production work of Adrien Durand, arranger of French band Bon Voyage Organisation, the track stands out as an exhilarating tribute to infectious grooves and dancefloor culture. Their new EP includes two new tracks and various remixes.